Spanish fly is the trade name of a green, shimmering beetle that has a history in medicine. Another reputable drug was the Spanish fly, or blister beetle, a dried, emerald green beetle, Lytta vesicatoria, recommended by, among others, the 18th century Swedish doctor Rosén von Rosenstein. It was said to help headaches “all severe fevers, for toothache, when it results from rheumatism, all fevers with rashes, inflammatory fevers, runny eyes and ears, hip pains”. Even during the 20th century ”drawing plasters” have been made where the plaster’s ability to irritate the skin and cause blisters has been used. When the blister broke the disease was drawn out with the liquid. It was thought that an internal inflammation could be drawn to the surface. Today we know that the beetle contains a substance, cantharidin, which is a strong skin irritant and which causes blistering when coming into contact with the skin. When the skin is irritated, the blood flows more quickly in the surface blood vessels giving a feeling of relief from aching muscles, rheumatism and so on. That is why the ointment works. 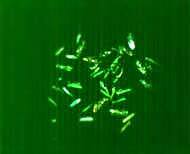 The Spanish fly’s ability to increase the surface blood flow has also been used in other contexts, for example as an aphrodisiac – a potency improving product – for men. Similarly a distillation of living ants was used earlier, which principally consisted of a mixture of water with formic acid that produced a skin irritant substance that was used as a liniment. 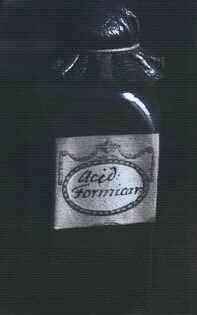 Acidum formicum or formic acid. This bottle is in Linnaeus’ medicine cabinet in Uppsala.